Tunisia has a semi-humid Mediterranean and an arid climate at the same time. The North which represents 25% of the surface receives annually rainfall ranging from 400 mm (North of the Atlas Mountain) to 1500 mm (extreme North). The central region (15% of the surface receives between 200 and 400 mm/year. The South, covering 60% of the surface receives only 200 mm/year. The total surface of Tunisia is 164 000 km2. 83 % of resources are used in agriculture. 17% of resources used are allotted to drinking water. Only 52% of water resources have a salinity lower than 1,5 g/l : salinity is relatively high. Legal status: non administrative public establishment under the supervision of the Ministry of Agriculture. Date of creation: SONEDE was created by law No. 68-22 dated July 2nd 1968 and law No. 76- 21 dated January 21st 1976. Water distribution: management and maintenance of drinking water networks and equipment and management of customers. Development: studies, works and supply. SONEDE has a specialized training centre and a team of competent trainers. SONEDE trains each year some 1500 Tunisian and foreign trainees. SONEDE INTERNATIONAL was created by SONEDE to promote and share the experience and know-how of SONEDE accumulated since 1968. SONEDE has 4 regional directions and 40 districts all over Tunisia. 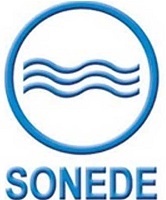 Drinking water distributed by SONEDE is meter-accounted for and billed according to a scale of progressive tariffs with several quarterly blocks of water consumption. SONEDE applies the same tariffs all over the country. The progressive tariff system is an instrument for demand management and contributes towards preventing waste and rationalizing use. 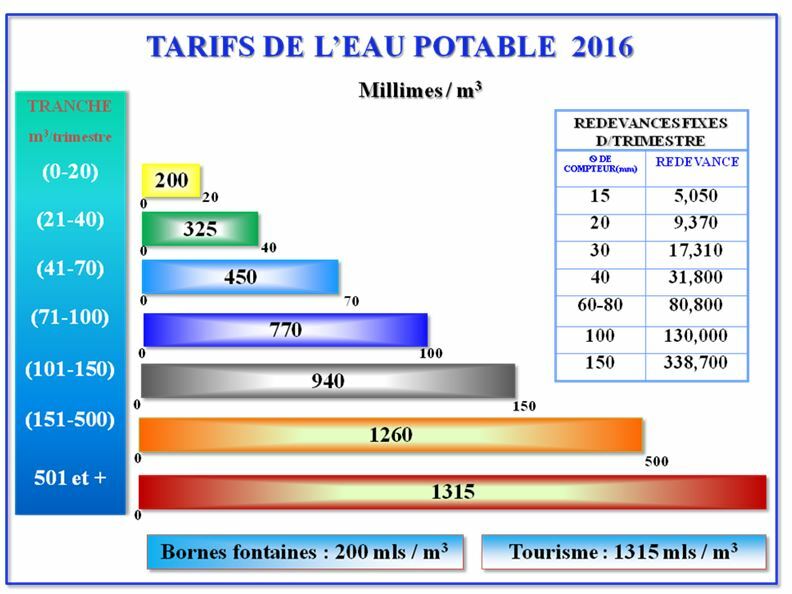 The applied tariff is represented in the following graph and will have an annual 7% increase until 2016. Each year some 50.000 water samples undergo, in compliance with the Tunisian National Standard NT 09-014, bacteriological and physico-chemical tests at the three laboratories of SONEDE based in Tunis, Sousse and Sfax. 98,6 % of these tests are good and this percentage is higher than the rate set by the recommendations of the World Health Organization. Water quality is also controlled by the Ministry of Public Health. Situated in the North West of Tunisia the Governorate of Jendouba is considered as one of the regions where the supply rate in rural areas is the weakest. In this framework a major project was launched to improve the supply rate in this governorate to achieve 97,6 % in 2025. -Project components: construction of a treatment plant with 400l/s capacity, construction of 30 reservoirs and 20 pumping and increasing pressure stations and laying of 340 km of pipes. The total cost of the project is around 85,6 million Dinars. It is funded by the Japanese International Cooperation Agency (JICA) and the Tunisian Government. -Beneficiaries: the project will allow to achieve the primary network for 203.000 inhabitants living in 1016 villages and small towns. The secondary network will be beneficial to 20 villages and small towns. 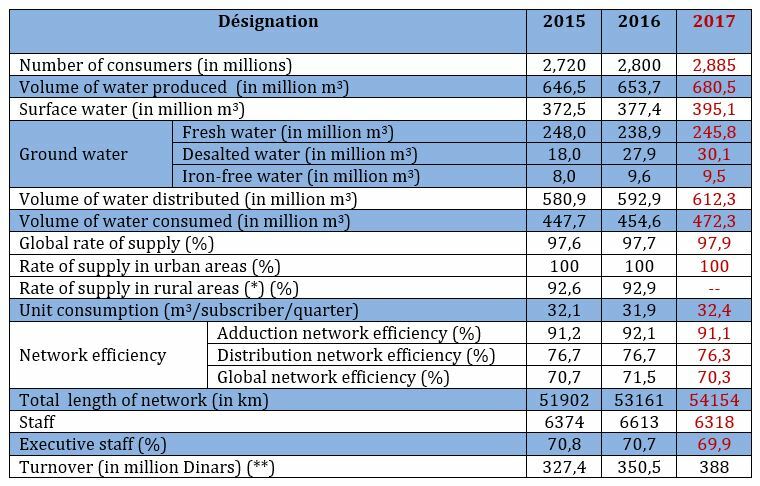 In order to reinforce the capacity of drinking water production and improve water quality in the island of Jerba a sea water desalination plant is was implemented for the first time in Tunisia, with a 50.000 cubic meters / day in the first phase and 75.000 cubic meters / day in the second one. The total cost of this plant is around 160 million Dinars funded by the KFW. The plant is due to be operational in 2016. This project will be achieved in two phases and aims to improve the water quality in the Tunisian South. Had benefit from it villages and small towns where the number of inhabitants exceeds 4000 inhabitants and water salinity is higher than 1,5 g/l. 1st phase: It concerns regions where salinity exceeds 2g/l and aims to achieve 13 projects 10 of them with desalination plants whose capacity ranges between 800 and 9000 m3/d. This project was implemented with a funding from KFW estimated at 50 million Dinars. 2nd phase: It concerns regions where salinity ranges between 1,5 and 2g/l and aims to achieve, among other things, 6 desalination plants whose capacity ranges between 2.000 and 3.000 m3/d. This project is under consideration and its cost is around 129 million Dinars. In order to improve relations with customers SONEDE has already started the setting of a new commercial information system whose cost is 5 million Dinars and funded by the World Bank. The project will be completed in October 2015. In order to upgrade technical performances and management mode SONEDE has started the setting of a geographical information system project to ensure better management of networks. The second objective of this project is to better control the assets and infrastructures of SONEDE. The project whose cost is around 7,5 million Dinars is partly funded by the French Development Agency and will be implemented in several phases and likely to be completed in June 2017.